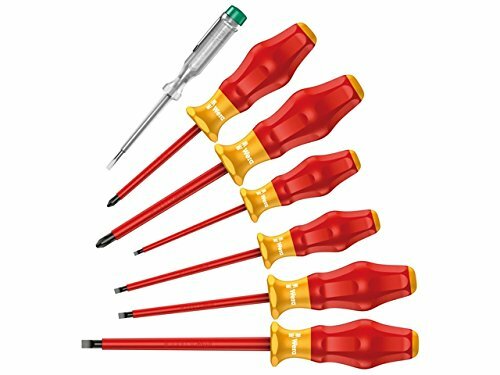 High quality Kraftform Comfort VDE screwdriver set. Multi-component Kraftform handle for fast and low-fatigue working. The Wera Black Point tip and a complex hardening process ensure a long service life of the tip, enhanced corrosion protection and an exact fit. Individual testing in a water bath at 10,000 volts so as to ensure safe working at the permitted voltage of 1,000 volts. The hexagonal anti-roll feature prevents any bothersome rolling away at the workplace. Handle markings for simplified finding and sorting of the tools. Includes voltage tester.